EVE Online is about to embark on the second decade of its voyage into community backstabbing and capitalist warfare. Such a milestone is clearly due some kind of celebration, and CCP think the perfect gift for a ten-year old is a chest full of goodies. 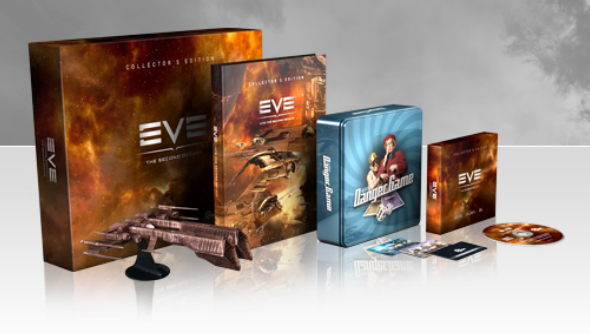 EVE: The Second Decade Collector’s Edition is available now for all those looking to celebrate. A Rifter USB hub, offering four USB ports for your desktop needs, all in the shape of the iconic Rifter spacecraft. Into the Second Decade hardcover book, offering 190 pages of glossy, full-colour details on the last ten years of EVE, right up to the launch of DUST 514. The Danger Game board game, an English-language adaptation of the Icelandic game. Made originally by CCP in their early years, this humble board game helped fund the creation of EVE Online. EVE Symphony CD, which contains a live performance of the EVE soundtrack as performed by the Icelandic Symphony Orchestra. A CCP Mystery Code, that unlocks a multitude of benefits in-game. At the moment not everything contained within the code has been revealed, but it will certainly include one PLEX to either trade for in-game currency or a month of play time, a Phanca Cybernetic Arm for use in the Rubicon expansion, and a Templar Mark II Prototype ship for use in EVE: Valkyrie when it finally arrives on VR headsets. A bunch of codes contained in The Second Decade Collector’s Edition will also unlock the Golden Pod skin for capsules, a Gnosis blueprint, The Time Capsule containing a selection of over 25 collectables drawn from a decade of EVE history, a new skin for the Amarr Magnate frigate, and a fine selection of clothing. There will also be some powerful Amarr weapons and a collection of Templar dropsuits for DUST 514. If you’re a serious EVE player who feels like they can’t do without this collection of trinkets, then you’d best zoom off over to the EVE store and pick it up for a mere cool $149.99.